Interior window shutters are as practical as they are beautiful. You can use them to block external noise when your windows have too much to deal with. You can also use window shutters to control the amount of light that enters your home. And unlike what many people believe, shutters can be installed in any home regardless of its style or décor. Just make sure the shutter design you choose complements your overall home décor. In keeping with that, here are five things you should know before sifting through window shutters designs for your home. The dissimilarities between the different types of window shutters are mostly down to aesthetics and operability. Here’s a lowdown on each type and what makes it unique. Cherished for their country appeal, café style shutters leave the upper part of the window uncovered. Because of this, they let in a lot of light and some amount of privacy as well. These cute shutters are also affordable as they don’t cover your window completely. These shutters have independent upper and lower panels, which means you can open them (or their slats) independently of each other. They also offer the maximum flexibility and privacy and sit well in traditional-styled homes. Full heighted with a look that is reminiscent of New England, plantation shutters are perfect for giving your room a streamlined appearance. With the addition of a mid-rail, the upper and lower slats can be tilted independently of each other. 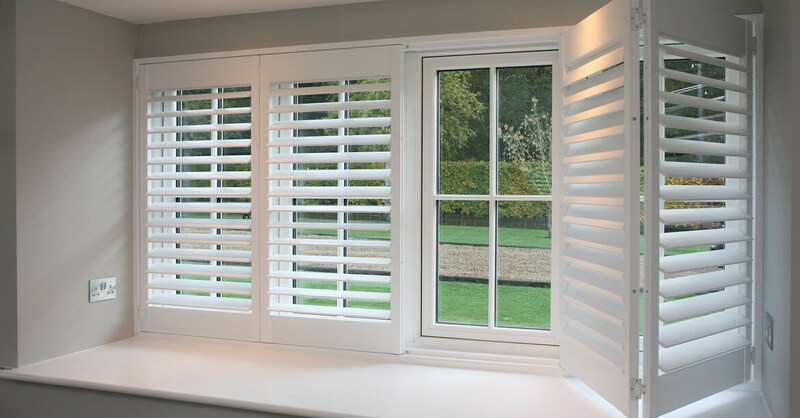 Oozing traditional French appeal, solid shutters can be installed either as one solid unit (which requires to be folded to let light in) or as a solid lower-slatted upper combination which lets some light in even when the shutter is shut. Window shutters for the inside are primarily made from polyvinyl or wood. The variety though stems from the extensive wood choices where there is an option for every budget. Where polyvinyl shutters score over wooden shutters is in waterproofness. This makes them ideal for homes located in humid regions, although they are just as suited for other climes as well. Wooden shutters, on the other hand, are perfect for non-humid locales. There are also aluminium shutters, even though they are a lot less common. Aluminium’s lightness makes it suitable for large windows, where the weight of wooden shutters can hamper ease of use. Fold back the panels – Want a full unhindered view from your window? Just fold back the shutters to reveal the windows completely along with some lovely sunlight. Tilt the slats – Keeping the panels closed while having the slats tilted just enough to let in some light serves two objectives, privacy is maintained while still letting in some fresh air and plenty of natural light. The convention is to go for shutters featuring wider slats for large windows. In case of smaller windows, shutters with narrow slats are the norm. Remember that wider the shutter’s slats, deeper is its frame. And although there is no precise reasoning for this, narrow slatted shutters suit traditional-styled spaces better. For more contemporary rooms, it’s hard to go wrong with wide slatted shutters. Regardless of what you choose, make sure your shutter’s tier-on-tier and mid-rain split points are in sync with the window’s dividing points. The shutter’s rails should sit in front of the frames while the slats should be positioned in front of the window’s glass. The window shutters décor is no longer restricted to just the old boring white, unless of course you actually like it. There are countless colours and finishes available for window shutters, ranging from soft and subtle ones to bolder and livelier ones. And since polyvinyl lends itself well to a variety of colours and finishes, you can even have your shutters custom-painted to suit the particular style of a room. As a final point, consider the cost angle as well when mulling over which window shutters to choose for your home. It goes without saying that wooden shutters cost more than their vinyl or metal counterparts. What you get in return for the higher price is a timeless look. You should also be prepared to pay more if you opt for more exotic varieties of wood for your shutter. For instance, bamboo carries a premium of over 50-70% over basswood, which is what a majority of wooden shutters are made of. Deciding on the right shutter is a pretty straightforward task if you know what you want. But if you find yourself confused, you can always turn towards professional help to get you through. A professional window blinds and shutter installer can offer wonderful insights and advice to help you choose the right shutter type for your rooms. Nice post and useful for people who are looking for shopfronts installation.